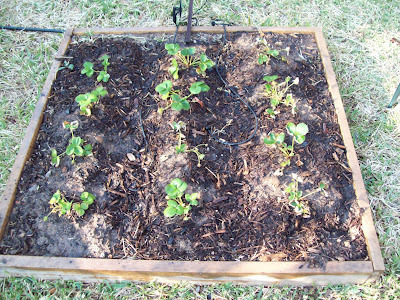 Here is my strawberry patch and onion/garlic patch, two good examples of square foot gardening, being 16 square feet each. The irrigation is no longer in the onion/garlic patch. Instead it is put in the strawberry patch along with the rest of it. The sprinkler seen at the top of the picture of the strawberry patch sprays enough on the other one. Hopefully I can keep getting the berries before the birds do. It's been a challenge so far, but it's been about 30/70 in my favor. 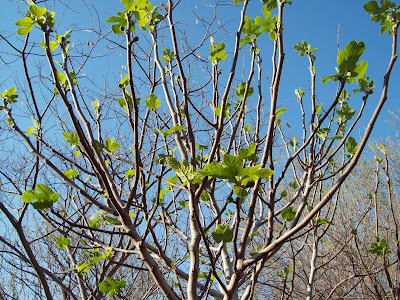 The fig tree is growing great this year with more than twice the figs than last year. I might just be able to get some sprouts this year for trading at the plant swap. For those of you who don't know, there is a plant swap coming up April 11, 2009 in Forest Park in Fort Worth, Texas. It's lots of fun and plenty of swapping and hanging out. A picture is worth a thousand words. Unfortunately I don't have any pictures handy so I will have to type them. This year we have started a lot of plants in pots outside until we can get more room created on the ground. We still have the onion and garlic patch in teh northwest corner of the backyard with the strawberry patch just to the south, which are producing pretty well since it's only been about a month since we started it. As of yesterday there were four nearly ripe berries and several on the way. We have an extra dirt mound that we've placed on top of an old rotted stump area. The stump hasn't been there for some time but there's still a little rotting wood underground in that area so there are a lot of bugs crawling and tilling it for us. In it I have put the left over garlic cloves and two seeds from a large squash of some kind. One seed has sprouted and a whole lot of garlic. In the pots we have some beet sprouts which are in desparate need of thinning as well as carrots, beans, radishes (which are very easy to grow), a transplanted blackberry and numerous flowers and herbs. The basil sprouts relly need thinning. They have grown in clumps as it seems that most of the seeds decided to sprout. Up front the pansies have gotten used to being planted and have bounced back. We have also finally gotten some lambs ear. We tried to grow it from seed but it never took.Hopefully I will get some time to take pictures of it all and share. 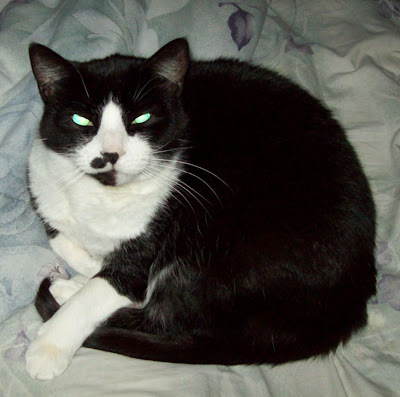 I may be a little late with this series of posts but here goes. It's mid March and time to plant. By now you should already have Carrots, Cabbage, Onions, Peas, Broccoli and Cauliflower in the ground. You can still plant some of these especially Carrots which can be planted in shifts every two weeks to have a constant supply for the next couple of months. Now's the time to start thinking about Radishes, which I have already planted and sprouted, it only took about a week to see the green tops coming up. These along with Mustard greens and Collards could have been planted in February as well. The newcomers this month are chard, lettuce, spinach and turnips. It's also time to start preping the beds for tomatoes, beans and watermelon. About two and a half years ago my wife and I went to a wonderful resort in Key Largo, Kona Kai. For staying there they gave us and everyone else a bottle of key lime juice to make a real key lime pie out of. Unfortunately we didn't get around to trying it for some time and ended up having to disard the juice since it changed colors and we weren't sure about the shelf life to begin with. Today, or er yesterday, we finally made a key lime pie with real key limes. Of course, as is my custom, I have decided to plant the seeds. 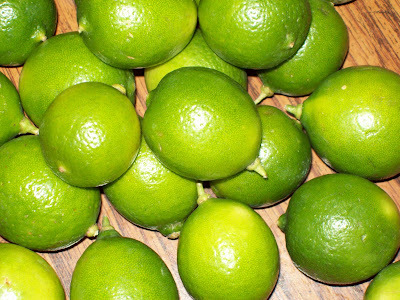 Since it takes many key limes to get enough juice I also have plenty of seeds and decided to plant them all in a single pot. I figure the odds are much better planting fourty or so seeds as opposed to one or two as in the case of the Kaffir Lime and Blood Orange seeds. I have a correction to a previous post though with both good and bad news. 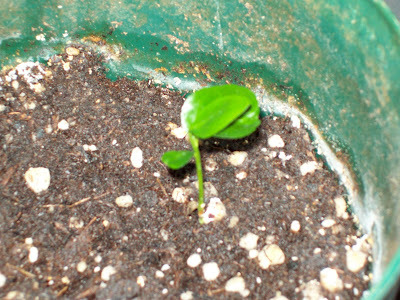 The good news is that whatever sprouted the first time was NOT the kaffir lime seed but a weed that just happened to find it's way in. The bad news is that it finally did sprout and quickly died as well as the blood orange... I think bugs got to them and, since I don't use pesticides, that can happen. 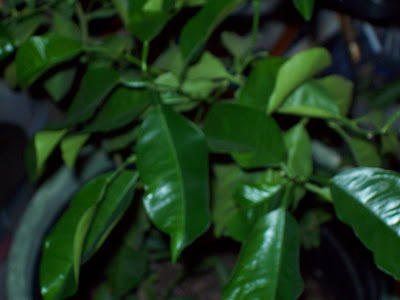 Below is a picture of the kaffir lime and lemon tree as they are just a few minutes ago. The lemon tree is doing good even though the destroyer of plants continues to feast on the lower leaves and throw them up wherever he wants to. Hopefully one day he will stop this bad trend and figure out that his stomache just wasn't made to digest lemon leaves. Onions and garlic and leaks, OH MY! It's that time of year again. Well, somewhere around that time at least.I got the onions and garlic in the ground last Friday and the leeks planted yesterday in pots. Yes, I know that leeks get a little bit too big for pots usually, but it's great for making sure they dry out enough and don't rot on me. 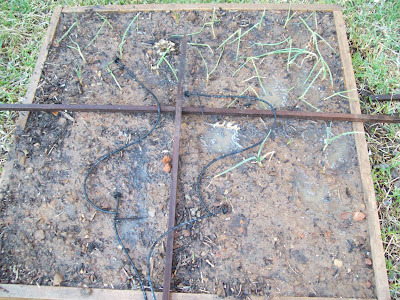 The onions and garlic are in raised beds for good drainage (just behind the strawberries, in their own bed of course). I don't know what strawberries would taste like if you mixed them with onion but I don't think I want to be the one who tries it. The irrigation is set up again and ready for the growing season. I just hope I can get up early enough this year to water before I have to go to work. I still have a tree to cut down and four more beds to prepare in the next week or so before it's too late to get plants in the ground. Yesterday I trimmed off a couple of waterspouts. The day before yesterday I didn't know what a waterspout was or why I might want to trim them off. Waterspouts are branches that grow from a relatively low point on the tree and generally grow straight up although some can grow at a variety of angles. They are fast growing branches with slightly larger leaves that the older branches and can reach canopy height within one season of growth. The problem with these is that they tend to to hog the water thus not allowing the other branches to grow as well while at the same time making the foliage denser since they generally grow in the middle of the tree instead of branching out. One suggestion for getting a citrus tree to grow better was to let it dry out for a spell until it's noticable and then to resume watering and feeding it.